The options for high speed or broadband Internet in rural areas are severely limited. You may be able to get fixed wireless where the signal is transferred using radio waves from a transmitter/receiver on a local tower or as shown in this video you can get a dish installed to connect to satellite internet in outer space. Bragg Creek is about 50 km west of Calgary, in the foothills of the Rocky Mountains – in the forest. About ½ km west of my house is Kananaskis a vast natural area. I like to say that I live at the end of civilization. Most of the time this is great, but when I want to jump on the Internet, it’s a big problem. The local cable companies won’t install high speed cable to the sparsely populated area beyond the hamlet. Davinci, the fixed wireless Internet Services Provider offers a very good service, if you can get it. That is, if it isn’t blocked by hills and trees. If you can’t you only have one choice, wireless satellite service. Ours is supplied by Xplornet. It’s basically the same as Wild Blue and Exede in the United States. In fact, in western North America they use the same satellite, ViaSat-1. Jet Blue airlines use the satellite for in-flight entertainment. They have portable systems used for news gathering and disaster relief. 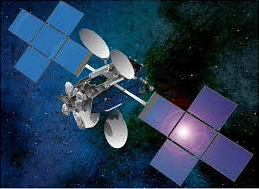 Xplornet also uses another satellite, the Echostar 17 to supply other parts of Canada. Xplornet purchased the use of 9 of the total 72 “beams” that carry the signal 35,783 km to the ViaSat-1 satellite in geostationary (fixed) orbit in outer space. Launched October 19, 2011 aboard a Proton rocket from Russia, it has a total capacity in excess of 140 Gbit/s. The service I subscribe to gives me up to 5 Mbit/s of that for download, up to 500 Kbit/s for upload with a monthly total data transfer of 20 GB. I added another 30 GB as an add-on for a total of 50 per month. That long return trip to space creates a pause before the content appears. This “latency” is noticeable, but not a problem unless you’re an avid gammer. It has an effect on VOIP phone calls, like Skype, but the software they use to manage the flow of data is intended to reduce this. That software is controversial as it throttles or slows down service to those who place a heavy load on their system. This is less of a problem now, but Xplornet got a lot of bad press several years ago. You can find XplornetSucks on the web where people also complain about slow and unreliable service. I, my neighbours and sites like DSLreports say that most of their problems have been addressed. They also say that the service is variable. My speed tests support that. I’ve seen a range of download speeds from 1.7 Mbits/s to 4.7. The blame game is active, but the load on the system seems to be a big factor. Xplornet will offer upgraded service in 2017, once they get new satellites working. Xplornet offers a fixed wireless service in Wintergreen, but I can’t get that signal. I used the Davinci fixed wireless service operating on a tower near Wild Rose for many years. I upgraded to their enhanced service about a year ago. It offers download speed up to 3.5 Mbit/s per second, but I usually got 1.5. As the leaves returned last spring, the service became unreliable. Then the hail storm hit on Aug. 1 destroying the equipment on the tower. The service went down for about a week and when it came back it wasn’t working well. That’s when I decided to switch. I update the weather on the braggcreek.ca web site every 15 minutes and I also provide updates to several other services. I use the web for other parts of my business and when it isn’t working, my business suffers. I would prefer to get Internet from a local supplier and I stuck with Davinci probably longer than I should have, but I had to make the change. Telus offers a cabled service in the Hamlet of Bragg Creek, but not here. So that’s why you see this man up on my roof installing the Xplornet dish and setting up the network connection in my office.